Today we did a project based on our science memory work. Everyone came in their PJ's to hibernate! 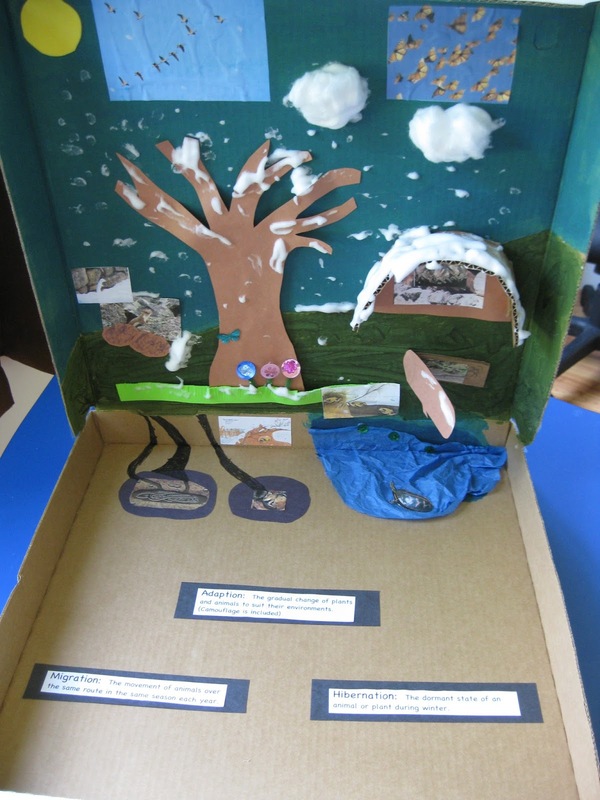 We made a diorama of how animals adapt to environmental changes - which in our case was the start of winter. When the kids came in, they first stopped by the gym and "hibernated" inside the "cave" that we had made with some gym mats and blankets! We later used the cave to do our review game. To start our day we got our lapbooks out and sang, wrote, flipped and drew our way through Week#5. The next thing we did was begin our project. I had picked out various animals and the definitions we were learning, to place in our diorama. I provided pre drawn and cut construction paper shapes of a tree, log, cave, burrows and rocks to place the animals around. I also used cardboard that I cut into strips. One strip was used for giving the cave a 3D look by bending it around the construction paper cave and gluing it in place. Another strip was folded in half and the construction paper log was glued to that strip to create a hinged opening so you could see what would hibernate inside of the log. There were pizza boxes for each child to do their project on, that I got from a local vendor for free. I set out paint, tissue paper, foam, hot glue, markers, regular glue, sequins, pipe cleaners, puff paint, construction paper and cotton balls. The kids were given a sample of what they were going to be doing that I had laid out on my pizza box for Sarah. However, there was room for lots of imagination. To begin with, the Moms cut out their pictures of animals while the kids started on painting the background of their diorama. We used blues and greens to designate sky, pond and grass. Briefly I tied in perspective art by describing the horizon line between the two elements they were working on (grass/sky). The next thing they did was decide where they would place their various elements of tree, log, cave and rocks. Then they began pasting and hot gluing their items into place. 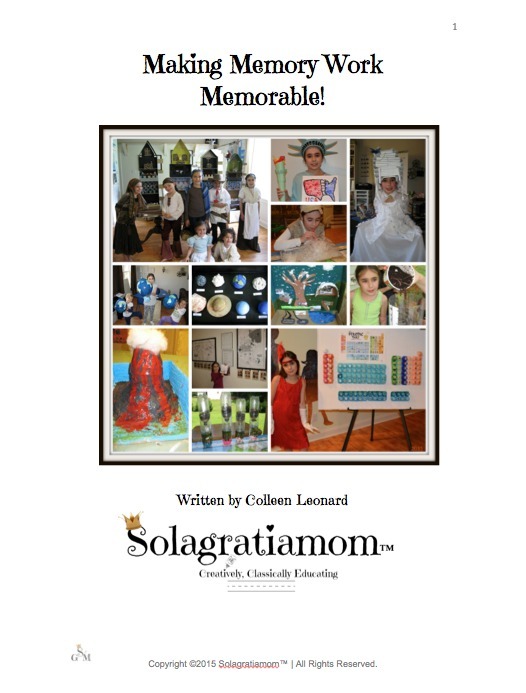 The kids worked their imaginations as they put finishing touches and embellished their project. Such as; drawing their tunnels to their burrows, adding flowers to their grass, placing a sun (or some did a moon). To finish it off, I mixed up the puff paint! A favorite around Wonderful Wednesdays! The kids delved in, mixing and then adding their touches of clouds and snow to their masterpieces! I couldn't resist making "porridge" for the day's snack! After all doesn't hibernating bears bring to mind Goldilocks and the Three Bears??? It seemed these little bears thought this porridge was just right! 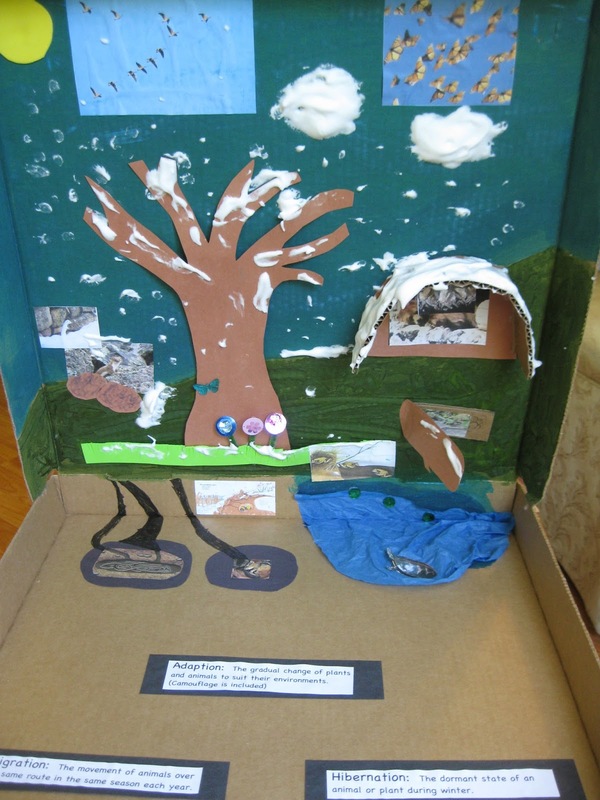 Hibernating animals: A bear that went inside our cave, bats that hung from inside the cave, burrow animals used were snakes and squirrels, pond animals were turtle and frogs, animals in the log were lizard and spider and a bumblebee for underground below the tree. Migrating animals: Geese flying south, Butterflies flying to Mexico! Adapting animal: Ermine - we used camouflage as our means of adaptation in winter weather. He was placed near the rocks and pictures of him during the summer when his coat is brown and winter when it changes to white were used. I so wish that I was a part of your group =) One day those kids will look back and realize what an awesome opportunity that had with all you guys do. Also, I think your PJ idea was fantastic for the hibernation week. I'm sure the kids loved it! Ditto Amy. Kudos to you for making this lesson come to life for the kids.